A handful of small businesses owners gathered Wednesday in Helena with Gov. Steve Bullock to celebrate “SBDC Day,” a day recognized nationally by 1,000 small business development centers, including those in Montana. In fact, the national day of recognition was spearheaded in Montana by Rebecca Ziegler, the marketing and public relations specialist for the state chapter of the Small Business Development Center. Gathered at a climbing gym, Bullock recognized a number of upstart small businesses across the state, from Chilton Skis in Missoula to the Stonetree Climbing Center in Helena. Combined with thousands of other small businesses, they represent the backbone of the state’s economy, Bullock said. Since its founding in 1989, the Montana chapter of the SBDC program has assisted more than 29,000 state entrepreneurs and nearly 6,500 businesses. Just this year, Bullock said, the organization has helped launch 73 new businesses and create or retain 616 jobs. The state’s unemployment rate is now 3.9 percent, the lowest it has been in a decade, Bullock said. The SBDC program in Montana has been instrumental in helping new businesses get off the ground – and recognizing those at the leading edge of success. Last week, the organization held its Shark Tank competition, which saw TOMIS, a Missoula software company, take home the $5,000 grand prize. 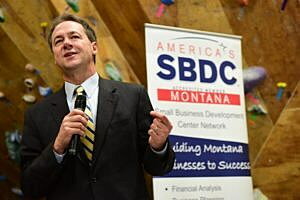 Bullock recognized March 22 as SBDC Day in Montana.